This tour begins between 9.00 and 9.30 am. Ideal for a rainy day. We are comparing Small Group Cooking Class with Florence Market Tour Prices from leading ticket suppliers and Try to find you Cheap tickets prices on the market. Begin the day by meeting your guide in Central Florence, together you will walk to the Central Market, located inside an impressive 19th-century building. Visit the butcher's counters, the fruit and veg stalls and bakery. Learn how to shop and barter like a local, you'll also be invited to taste some locally produced foods and wines. After you've finished shopping you'll head to the cooking school for a menu briefing and then it's time to get cooking! Recipes can vary, but your 4 course lunch will typically include a bruschetta starter, pizza, homemade ravioli, gnocchi or tagliatelle with fresh sauces, followed by a sweet dessert, perhaps pannacotta or tiramisu. Finally you can relax and enjoy lunch with local Chianti wines in the company of your fellow classmates and teachers. Perfect for anyone who wants to impress their guests at their next dinner party. If you're bored of city tours and museum visits then this is an ideal alternative. 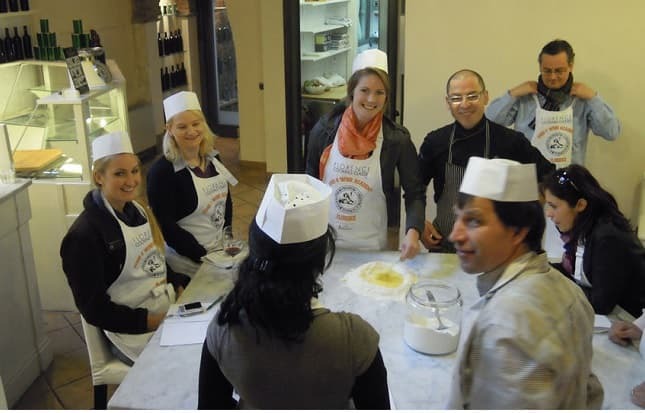 Your Experience With Small Group Cooking Class with Florence Market Tour? Learn how to shop, cook and dine like a local with a 5-hour Italian market tour and cooking class. Enjoy a delicious 4-course typical Tuscan dish (prepared by you) accompanied by locally produced wine. Graduate from the Food and Wine Academy of Florence. What Small Group Cooking Class with Florence Market Tour Includes? Cooking class with local chef and 4 course lunch with local wines. All ingredients, kitchen and utensils. Graduate Diploma, recipes booklet and complimentary apron. If you're unlucky with the weather during your holiday in Florence this cooking class is a perfect way to spend a rainy day. If you have any dietary requirements you should advise your tour agency in advance. Travelers Reviews about Small Group Cooking Class with Florence Market Tour? The Tuscan cooking class is led by a professional chef and travellers have complimented the skills of their teacher. The experience has an average 5-star rating on TripAdvisor as well as Viator. On Get Your Guide the cooking class has a 4.9 out of 5-star rating. Vouchers can be presented in print or mobile form. Tickets are refundable but full amount may be charged if cancellations are made less than 3 days in advance. On Sundays the Central Market is closed, instead there will be extra food samples at the cooking school. Vegetarian options are available, please advise when booking.